-It is good for SOIC 20 pin SMD IC chips (SOIC and SOJ). -Bronze pins on upper end are standard .025' square pin header. Allow to use standard jumper wires to do the solder-less connection. 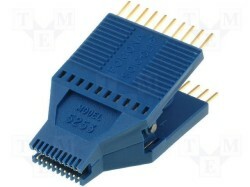 -For jumper wires can be used see CPT-022.